The headwaters of the San Juan and Rio Grande are close together in Southwest Colorado. The San Juan flows west, north of Monument Valley which is the area the watercolor shows. The crossing point was filmed in The Searchers. 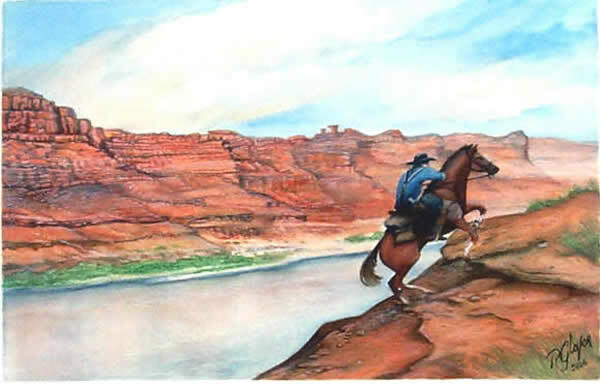 The horse and rider shown climbing from the river crossing were brought into the scene from other sketches by the artist. The work was exhibited at the Booth Western Art Museum / Southeastern Cowboy Festival & Symposium (2006). Click on the link for this year's festival vendors. Page-search for Bob Glover once you're there.